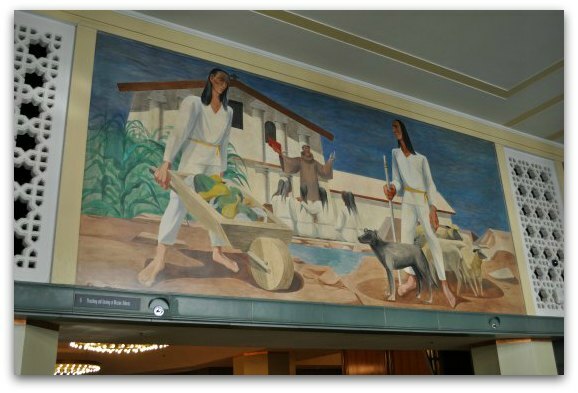 I enjoy heading to the Rincon Center in San Francisco to take a look at their historic murals. It is one of those hidden gems that most visitors miss. 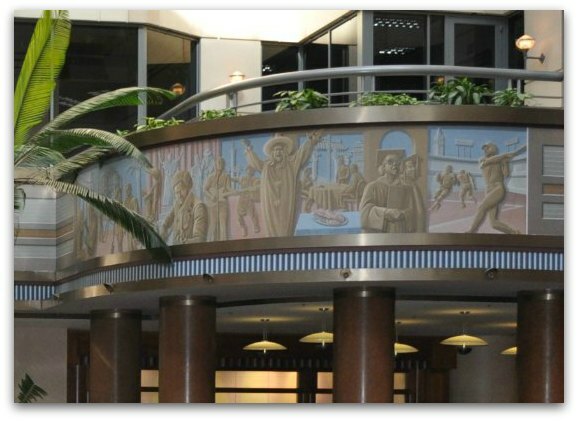 This historic Art Deco building offers several gorgeous historic murals as well as a modern fountain with water falling from the ceiling. After you look around, you can also grab some lunch in their courtyard and then head out to explore other parts of the city. This structure was built in 1940 as one of the main post offices in the city. 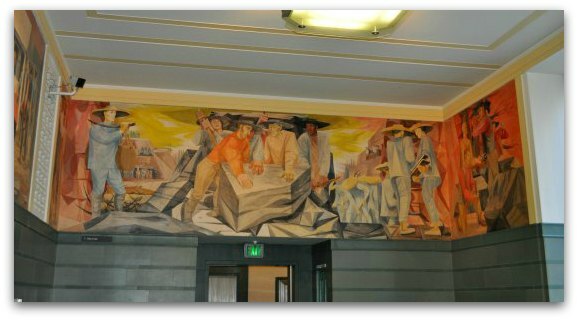 Shortly after its completion, the US government provided funds to add murals to its main floor. Today, people from around the world visit this building to take a look at these historic, yet controversial murals. 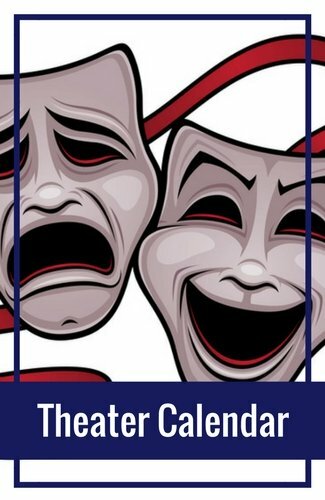 It's free to stop by for a look and all of them include a small description, so you can get a feel for what's going on in each one. 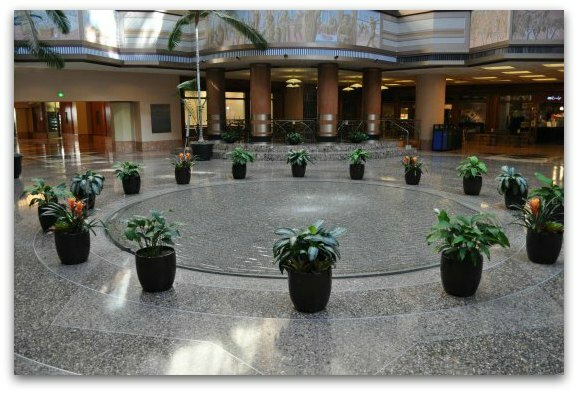 In addition to these historic murals, the new part of the Rincon Center includes several restaurants, a handful of new murals and a unique waterfall fountain. 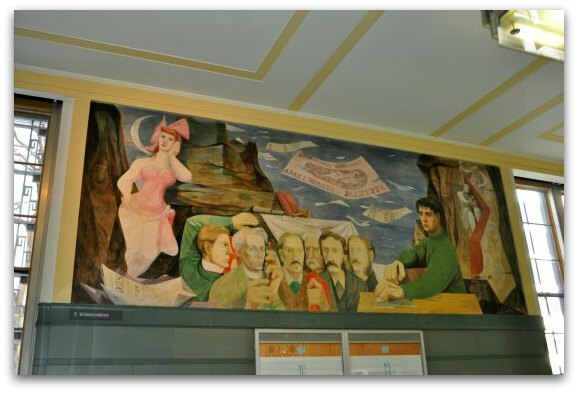 Read on to learn more about why these murals were so controversial, how to find out even more about them and some of the other things to do while you are here. 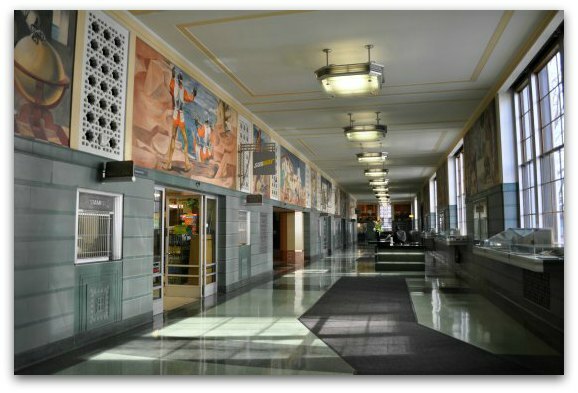 The main lobby of the Rincon Center with its historic murals. After several artists submitted their ideas for the Rincon Center mural project, Anton Refregier's set of twenty-seven murals was selected. His murals showcased the history of San Francisco, which the committee felt was the perfect addition to this public San Francisco building. Work began on the project in 1941. Due to World War II, the project was put on hold from 1941 to 1945. His project started again after the war and was completed in 1948. Even though Refregier's murals were selected for the project, they came under fire many times. Several of his murals included controversial messages and he was forced to make almost 100 revisions to them before he was paid. A few years after their completion, many of them again came under attack by the House Un-American Activities Committee. Fortunately, no additional revisions were made, so the ones you see today are the final murals as of 1948. Refregier grew up in Russia and was believed to be communist. His interpretation of the history of San Francisco was slightly different from what the US Government wanted on the walls of the Rincon Center. This is the reason many of them came under review and so many revisions had to be made before the project was finally completed. Here are just a few of the murals you will see when you visit the Rincon Center. 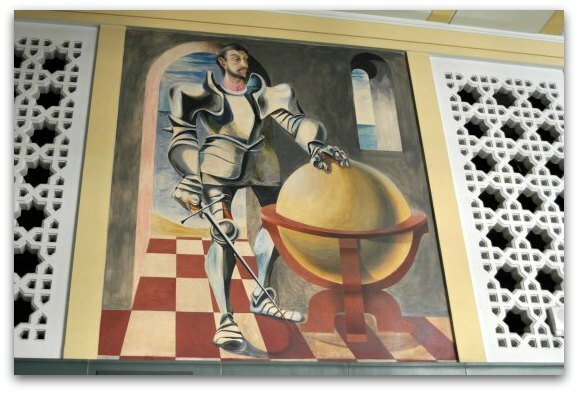 This mural showcases the explorer Sir Francis Drake. 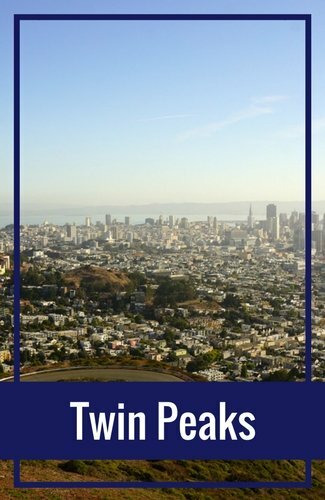 He is said to be the one to have discovered the area now known as San Francisco. You will often see these blank globes in explorer murals as a sign that so much in the world is yet to be discovered. This mural showcases the building of Mission Dolores, one of the first missions in the area and the oldest building still standing in San Francisco today (learn more about visiting the Mission Dolores). It's one of the murals that was revised. The original one hinted at the prosperity and superiority of the mission leader. He had a much larger frame and looked well fed. This is the figure in the back in the brown robe. In contrast to that, the two Native American workers in front where originally gaunt and looked underfed. The commission demanded all three figures be revised to show more equality among the three individuals. This is the largest mural in the Rincon Center in San Francisco. It shows several workers as they build the city of San Francisco. It's another mural that had to be revised. It originally showed only a few races building the city. The commission had it changed to show more diversity in the people involved in the process. This is another mural that was slightly revised. 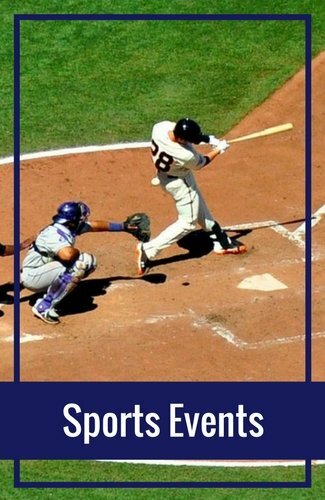 It showcases many of the controversial figures in San Francisco history (at that time). Some had propaganda painted in and all of it had to be removed in order to Refregier to get paid. This mural shows builders working on the Golden Gate Bridge. 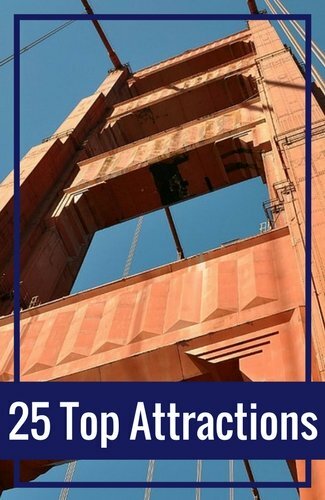 Even though this one was not controversial, I wanted to include it as the bridge is an important part of San Francisco's history. 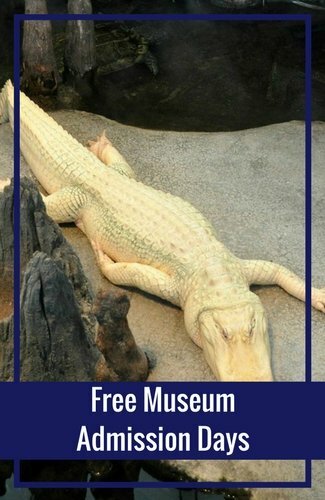 If you want to see them for yourself, you can walk through on your own and read the descriptions. 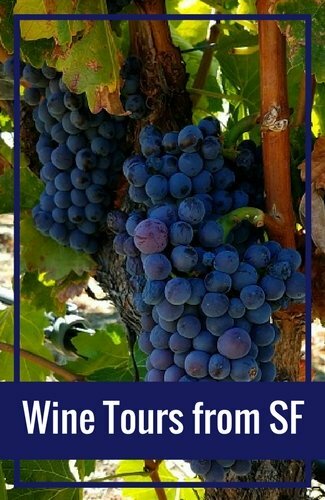 If you want to learn even more about them, you can also join the free SF Public Library walking tour. 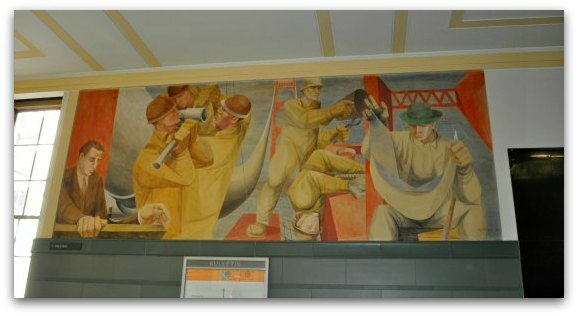 This 90-minute tour goes into great detail on each of the 27-murals in this part of the building. Even though the lobby is still intact, the rest of the original post office was demolished in the 1980s. 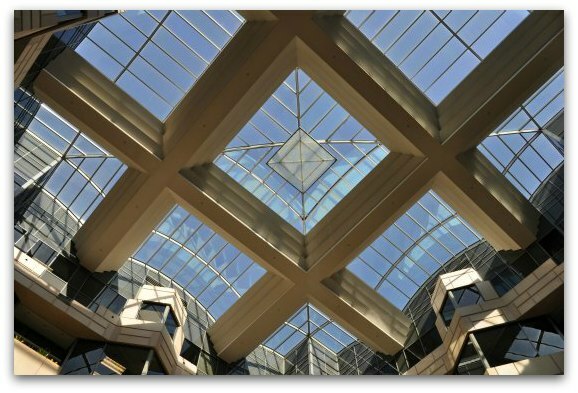 At this time, they constructed two large towers with both office and residential space. The lobby of the new part of the building is also worth a look. Here you will find a few, more modern San Francisco based murals. They depict recent events in the history of San Francisco. This is one of six murals in the newly built Rincon Center building. These murals surround the main centerpiece of the new lobby - a floor to ceiling 'waterfall' fountain. It's impossible to get one picture, so here are two pictures showing both the top and bottom of this fountain. The middle box is where the water gathers and falls to the pool at the bottom. This is the pool at the bottom that catches the water. On all sides of the fountain, you will find restaurants and shops. It's the perfect place to grab some lunch and watch the waterfall fountain in action. The historic section of the Rincon Center is open Monday - Friday from 8:30am to 5:30pm. The Rincon Center is on the corner of Mission and Steuart Streets. 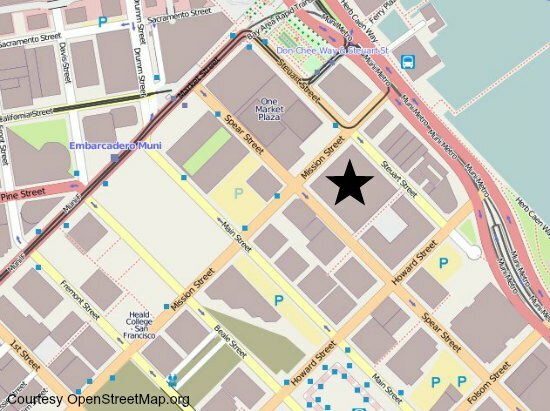 Walk: The Rincon Center San Francisco is just under a mile from Union Square. You can walk down Market Street, take a right on Spear Street and enter the Rincon Center from the Spear Street doors. Public Transit: You can also take public transit. There are a number of options running down Market Street including the F Street Car, the underground Muni light rail and several buses. The 21 will drop you off about a block from the Rincon Center entrance. Public Transit: Your best bet from Fisherman's Wharf is the F Street Car line. 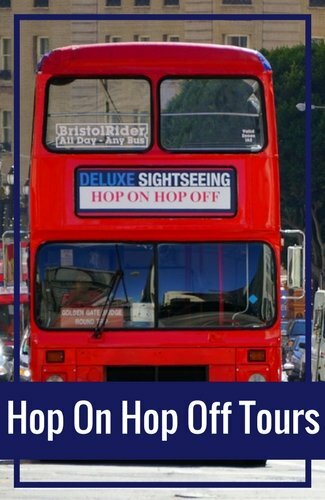 Hop off in front of the San Francisco Railway Museum at Don Chee Way and Steuart Street. You will then head south (past the museum) to get to Mission Street. The Rincon Center is on the southwest corner.